Members may place bets as usual; a certain percentage(%) from the total stake will then be contributed into the Personal Jackpot. 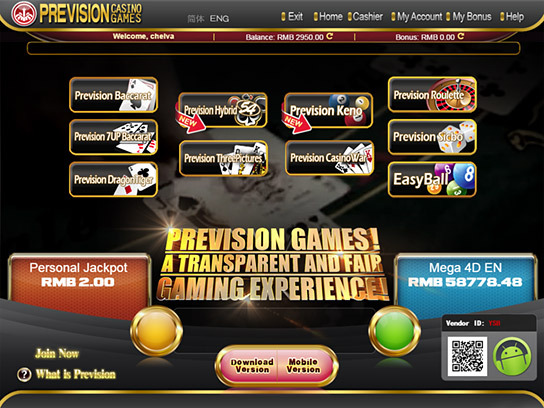 All Prevision games are entitled for Personal Jackpot, except Easyball & Prevision Roulette. A certain percentage(%) from a Member's total stake will be contributed into the Personal Jackpot. Only bets placed with CASH Chips will contribute into the Jackpot. Any Risk-free bets or bonus bets will not contribute into the Jackpot. 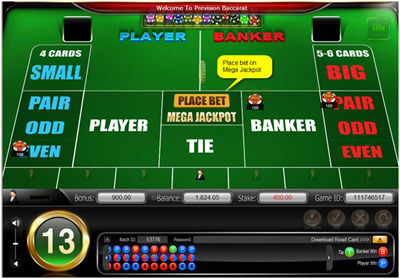 To win the Jackpot, Members have to hit any of the game conditions. ** Note: All conditions and percentages are as above unless otherwise specified. The winning jackpot will be credited automatically into Member's Prevision account, no play through is required. Prevision Games reserves the absolute right to terminate, cancel and / or void all promotions without any notification. In the event of any disputes arising, whether it is in regards to wagers, payouts, regulations, or whatsoever, the decision of Prevision Games is final. Place chips on desired selections. You may choose multiple selections, but one of the selections has to include either Banker or Player. Click on 'Deal' to confirm bets. Once bets are confirmed, proceed to click 'Place Bet' on Mega Jackpot for your lucky chance to win a huge jackpot, good luck! 1. Mega Jackpot is a separate entity from other bet types and has a fixed betting amount. 2. In Baccarat, Members may bet on multiple selections in the same hand, however the selections must include either Banker or Player and Mega Jackpot in order to win the Jackpot. 3. Only bets placed with CASH Chips are qualified to win the Jackpot. 4. Any Risk-free bets or bonus bets are not entitled to win any Jackpot. The value for all 6 cards are in sequence (suits are excluded). 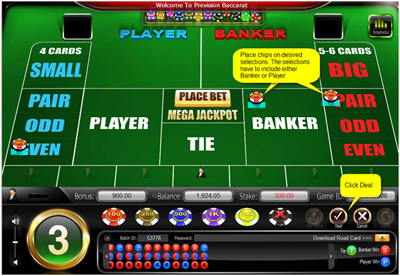 Example Player: 2,3,5, Banker: 1,4,6, combined sequence is 1,2,3,4,5,6, win jackpot. 4 cards of the same value but each with a different suit. Example Player: 2♣, 2♠, 3, Banker: 2♦, 4, 2♥, there are 4 cards of 2 with different suit, win jackpot. Any 5 cards of the same suit and the value are in sequence. Example Player: Q♦, J♦, 8♦, Banker：10♦, 9♦, combined sequence is Q♦, J♦, 10♦, 9♦, 8♦, win jackpot. SPADES (♠) are not applicable. Any 5 cards of Spades and the value are in sequence of 10, J, Q, K, A. Example Player: 10♠, J♠, Q♠, Banker: K♠, A♠, combined sequence is 10♠, J♠, Q♠, K♠, A♠, win jackpot. No Personal Jackpot will be accumulated from Mega Jackpot bets. If there is more than one (1) winning Members, the Jackpot Prize shall be shared equally. Members may apply for the winning Mega Jackpot via Customer Service. The winning jackpot will be credited into Member's Prevision account, no play through is required.